Now in its second year, the USCA New England 9-wicket Regional Doubles Tournament returned to Oakland, Maine on Sunday August 13. Nine courts were set up on a soccer field in Pleasant Point Park, next to McGrath Pond. There were three flights this year: Expert, Intermediate/Beginner, and Youth. Games were one hour long and if the score was tied at that point, the side closest to a contested wicket got the winning point. This kept the tournament on schedule. 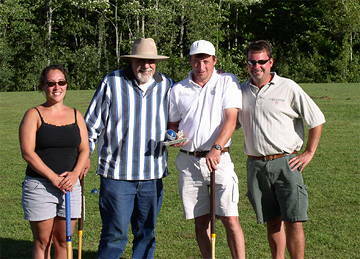 Oakland is home to a very large group of 9-wicket croquet enthusiasts including Jamie Boulette, this year’s Tournament Director. There was quite a bit of break play (your author ran four 4-ball breaks), and the challenging surface kept the games interesting. The Youth and Intermediate/Novice flights used the basic USCA 9-wicket rules while Expert Flight used the optional deadness and boundary rules to add to the challenge. After four preliminary rounds, the top two teams in each flight advanced to the finals. The Youth flight featured Sam Dexter and Corey Foye as the winners with Katy Massey and Lauren Nawfel coming in second. Intermediate/Novice had Michelle and Jim Putnam coming in first and Tom and Lisa Burton taking second place. Expert Flight had Larry Stettner and Dave Nelson winning (interestingly, Dave Nelson was a participant in the first USCA 9 Wicket Nationals in 1995) with Danielle and Matt Marquis coming in second. Danielle is a very gifted croquet player! Jamie Boulette directed the tournament, with assistance from Bob Kroeger.